In L. Sprague de Camp’s classic alternate history novel Lest Darkness Fall, Martin Padway is transported to fourth-century Rome, where he changes the course of history by importing advanced technology into his new home timeline. Exactly. But! It’s math! In every sense, the zero is a game-changer. It weighs nothing, and most of us have some grasp of how it works in our brain’s back pocket. Given enough time, a willing audience, and possibly a little brandy, most of us could explain it. It is a popular conceit to imagine that we non-engineers are too distanced from humanity’s inventions to reproduce them. To assume that if one of us was transported to the far past, our inability to scrape together an iPhone from scratch would make us, somehow, technologically pathetic. We are the guys for whom science might as well be magic, the thinking goes. A 21st century arts graduate couldn’t really trigger a scientific revolution. I disagree. We all have weird pockets of exploitable knowledge, picked up in classrooms but also in more mundane places. If you’re committed to the idea of meddling in time at all, the key is, perhaps, in knowing what you could usefully bring to the past you’re in. Which brings me to A Daughter of No Nation. 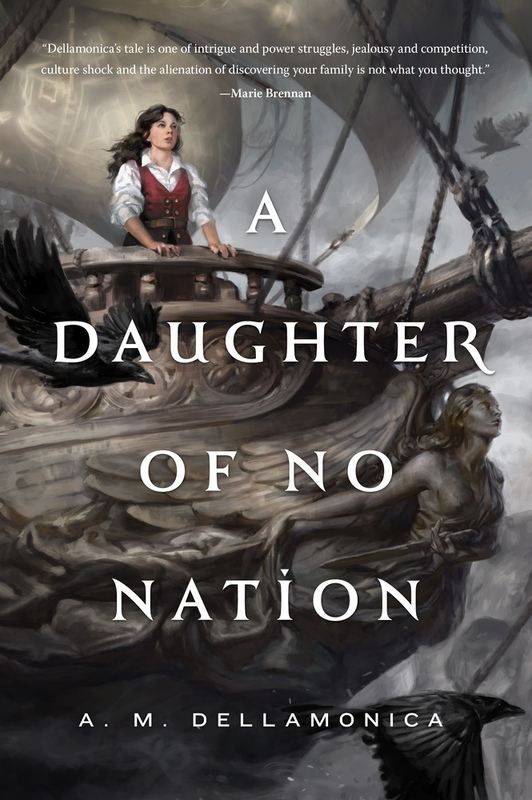 Sophie Hansa is a trained wildlife biologist, but over the course of this second Hidden Sea Tales novel she discovers that the two things she’s most likely to end up importing into the culture of the world of Stormwrack are ideas. One is the scientific method. The second is criminal forensics…as learned from TV. Sophie, like me, is fannish. She watches Castle. She loves Veronica Mars. She grew up in twenty-first century North America and has seen hundreds of hours of crime and cop shows. She’s seen quasi-realistic stuff like Law & Order and Criminal Minds, and implausible set-ups like The Mentalist. She’s even watched some really weird things like Vexed (whose cop protagonists work out of a coffee shop). In our world, it would be disastrous for an ordinary civilian to try to apply dumbed-down TV-style detective procedures to real-world crimes. But Stormwrack is a world apart, and it’s one where most of the people don’t have the mental habit of analytical reductionism (approaching a new phenomenon by mentally breaking it into components, and then pushing them around to see how they might be understood). Sophie doesn’t have to have years of training in the physics of analyzing blood spatter. She just has to pass on the idea to a motivated cop. Even the concept of preserving a crime scene is every bit as radical, on Stormwrack, as double-entry accounting was to de Camp’s ancient Rome. It was a radical idea here, too, at one time. Now it’s just standard procedure. Sophie does have an advantage that many of us wouldn’t if we were inventing modern police procedure in a world trapped in the Age of Sail…she has some grounding in biology and chemistry. But when she’s asked if she might consider doing this, importing this particular piece of earth technology, she’s drawing as much on Sherlock Holmes and Blue Bloods as on anything she learned in a classroom. Follow A. M. Dellamonica on Twitter at @AlyxDellamonica, on Facebook, and on her website. I read an ARC of this book, and after a couple of chapters had to go back and pick up the first volume–not because I couldn’t enjoy this one as a standalone, but because it was so engaging that I wanted to back up and start with the beginning. Fresh voice, terrific world building, believably flawed characters who felt like real people experiencing extraordinary circumstances. Good pacing, too, as the story moved right along. VEXED is great! Well, really good. This sounds like it is right in my wheelhouse. I’m an aquatic biologist, not wildlife biologist, who likes to watch cop/forensics shows. Have just ordered this book and the previous one. Can’t wait to read them.